Well, it’s official. Apple has a 7.9-inch iPad mini coming in the next few weeks and it cost $329 or more. Hide yo kids, hide you wives, this thing is going to kill off Android tablets. If you listen to Apple tell it, the new device is going to be embraced unlike anything we’ve ever seen. Google’s friends and allies ought to throw in the towel, right? Hardly. If you want to compete on price point alone, Android is gonna be just fine. 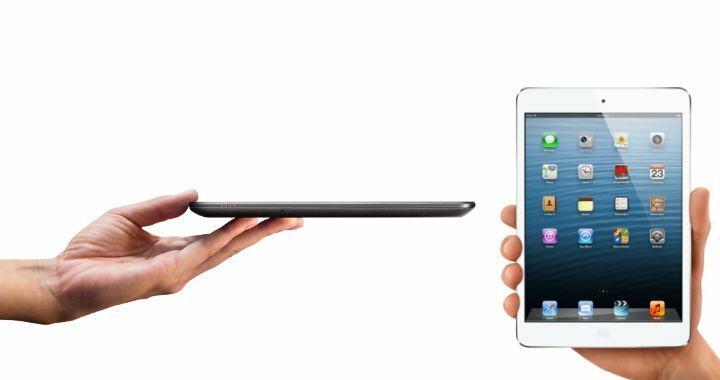 Should you opt to look at hardware, Apple’s new iPad mini already lags as compared to some of today’s Android counterparts. If you are an experience Android user and really want to keep on the forefront of the platform, the Nexus 7 is still the winner. It’s a stock Google experience that just happens to be the latest release available. The Tegra 3 processor is in a class of its own and the Google Play store opens the door to an exponential number of apps, including Amazon Appstore. Apple’s iPad mini is going to sell well to its base however we don’t see anything here that scream “awesome new experience”. Honestly, and without bias, we cannot find something that justifies a new tablet buyer coughing up another $130 over Android. Yes, there’s the ecosystem and apps, but we are scratching our head at the bigger picture. To us, this eats from the plate of both the iPod Touch and iPad. Seriously, if you are an Apple lover or fanboy, there’s nothing we can say here that’s going to sway you. You’re going to buy Apple no matter what and you don’t care how much it costs. If you really must make a purchase right now (Oct 23) and want the most bang for your buck, the Nexus 7 is the choice. Thanks to its higher resolution display and much cheaper price point, it looks as good as it performs and saves you money in the process. When you consider that Apple was so quick to replace the iPad with a new 4th generation announcement, it tells you that it cannot afford to wait around for annual devices. For them to have to bump the specs in its super-popular device so quickly, and to talk so much about the Nexus 7, tells us Apple is concerned. The Nexus 7 is a serious threat to Apple and we’re not even talking about lower-priced stuff on the horizon.